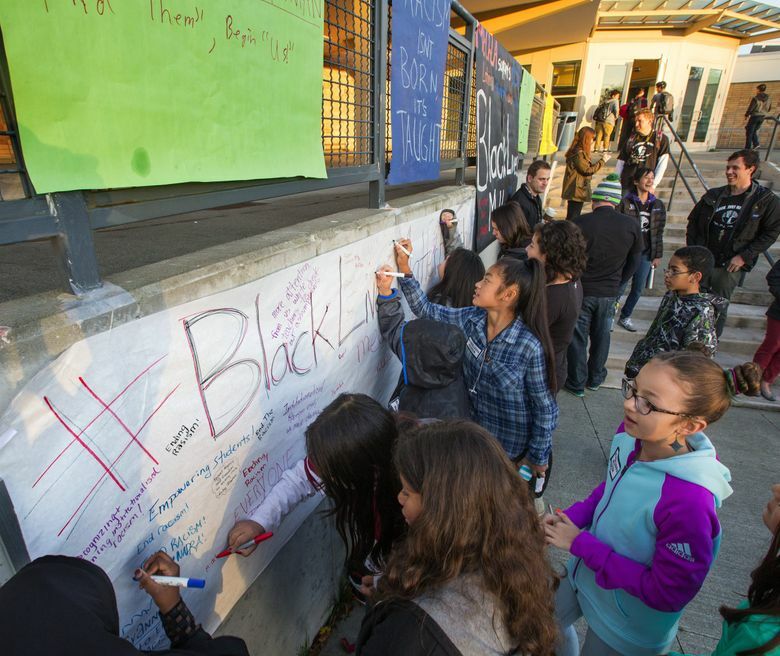 The “Black Lives Matter at School” rallies attracted hundreds of students, parents and teachers on Wednesday. 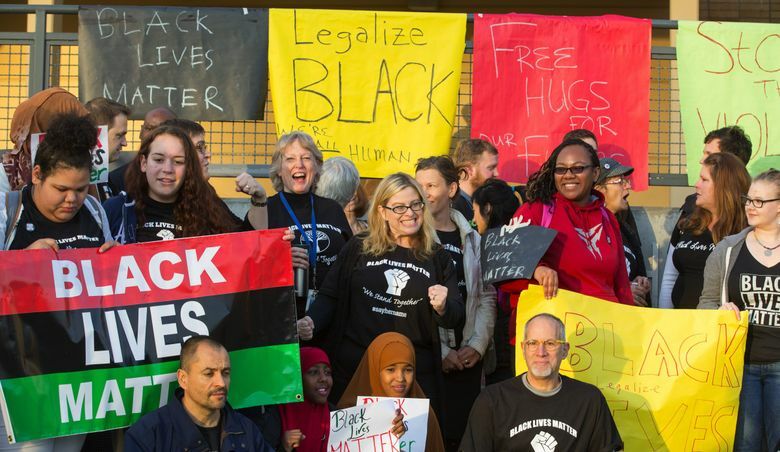 About 2,000 Seattle educators wore Black Lives Matter shirts at their schools Wednesday to call for racial equity in education. About 60 Chief Sealth educators had ordered the shirts beforehand. Some of the shirts said “Black Lives Matter” and “#say­hername,” a reference to Sandra Bland, a black woman who died in police custody in Texas. Those shirts had an image of a fist. Others wore shirts that said “Black Lives Matter” and “We Stand Together” with an image of a tree. Teacher Diana Romero said she decided to wear a shirt “to support our black brothers and sisters in support for justice.” As a Latina, she said she has seen firsthand the unfair treatment of people of color by police officers. 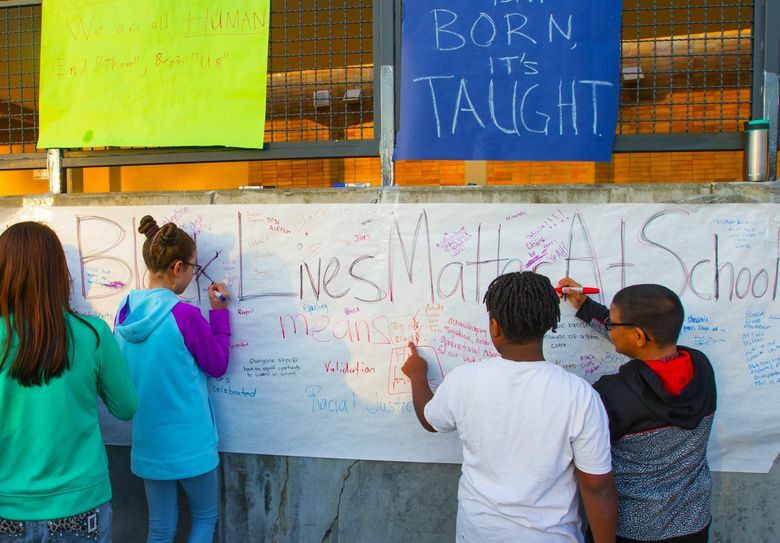 A sixth-grade class from nearby Denny International Middle School, whose teacher brought them to the Sealth rally, wore Black Lives Matter stickers. Teacher Ben Evans said he wanted them to see how their voices can be heard. 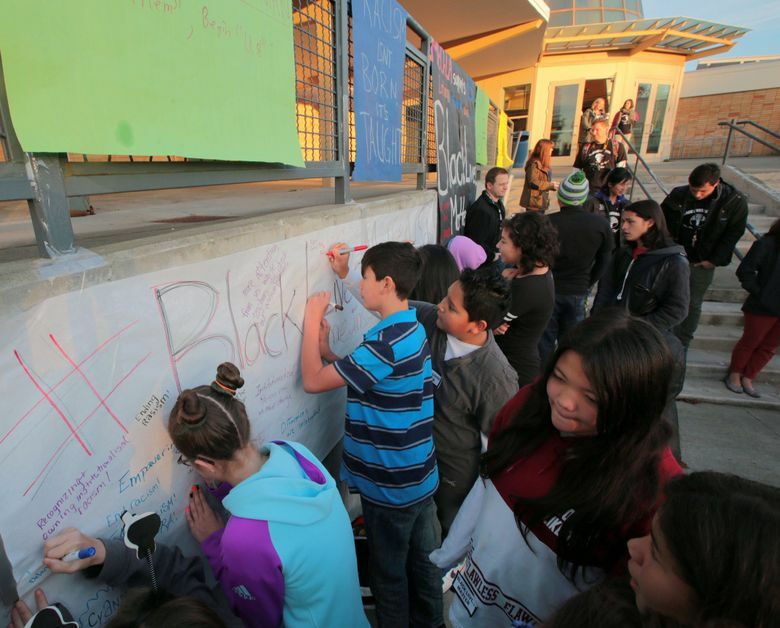 Many of his students are aware of racial inequities already, he added. 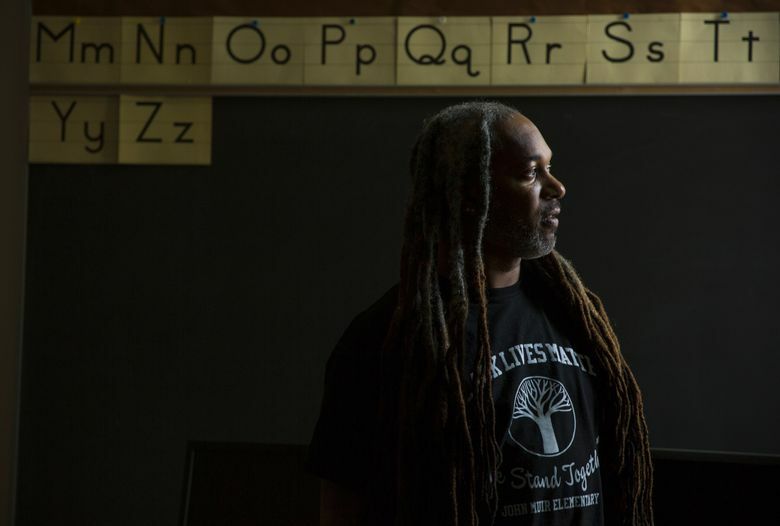 “Black Lives Matter At School” wasn’t sponsored by the school district, but it coincides with Seattle Public Schools’ “day of unity,” aimed at bringing more attention to racial equity in education. The district said in a statement that it has asked students, family, staff and community members to “engage and join the conversation in our united efforts to eliminate opportunity gaps.” As a public institution, the district doesn’t take official positions on social or political movements, district spokesman Luke Duecy said in a statement earlier this week. Because Wednesday’s rally at Sealth was not an official district event, teachers were told to leave before students started arriving for school. But members of the Black Student Union (BSU) remained until the start of classes. For BSU President Precious Manning, 17, the rally and shirts represented the international school coming together in solidarity. Black Lives Matter means making sure everyone is included, she said. 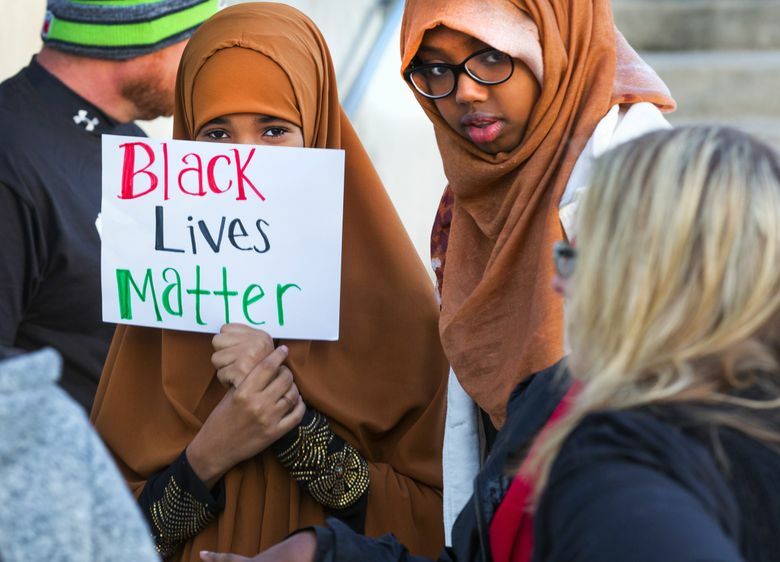 “Black Lives Matter means ‘don’t leave us out,’ ” she said. In addition to Seattle schools, staff at Highline’s White Center Heights Elementary wore shirts. Another “Black Lives Matter At School” rally is planned for Wednesday evening at Washington Hall, where activists and artists, including Grammy-award winning singer-songwriter Kimya Dawson, will perform and speak about racial equity. Seattle Seahawks defensive lineman Michael Bennett is also expected to attend. The event is from 6-8 p.m. at Washington Hall, 154 14th Ave., in Seattle’s Central District.